Last week I attended a block party that a few neighbors had thrown together. As the party dwindled down and we closed in on the card table that contained the beer and wine; the bottle of Provencal Rose became the topic of discussion. Many of my neighbors refused to believe that pink wine could be any good and while the bottle that we were drinking, the very popular AIX was a fair effort, it had been subjected to the heat of the day a bit too long to hold it's character. What followed however was a conversation between myself and a number of my male neighbors that Rose, particularly the Rose coming from Washington was serious and of a high quality. In 2011 no wine drives that point home like the Tranche Cellars 2010 Pink Pape Rose. A blend of Syrah and Cabernet Franc the resulting wine is beautiful to look at with its salmon hue, but instead, I recommend drinking it. Elegance is probably the best way to characterize this wine. 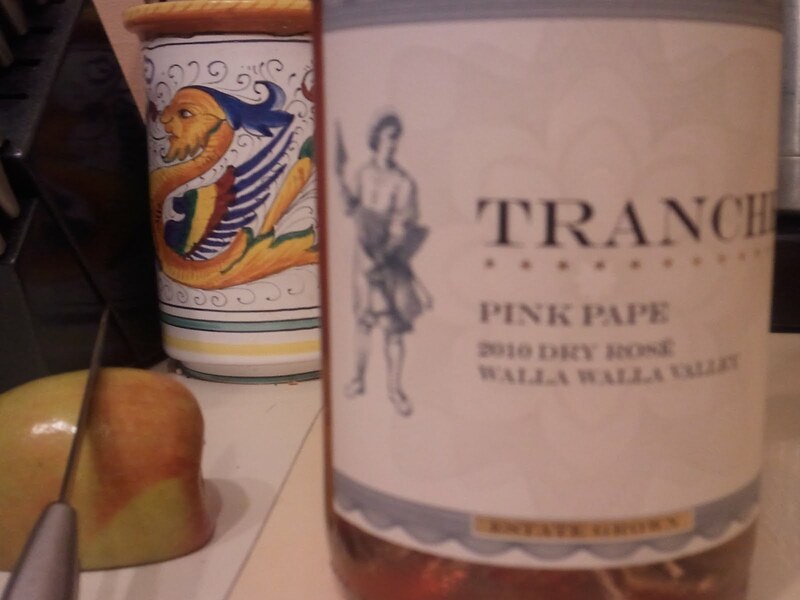 Its aromatics are subdued strawberry, rhubarb and floral notes. The wine's palate continues that elegance with bright well balanced acidity, hints of grapefruit continue but are balanced by a minerality and stone character. The fruit was picked early (in September) to bring that clean fruit and acidity to the fore. Care was taken on this small production wine, whole bunch pressing and aged on lees for 5 months. This production by Tranche Cellars is an embodiment of what they've done across the board, produce wines with extreme attention to quality and the lowest quantities (168 cases for this one) that come in at incredibly approachable price points ($16). This Friday Find is a bit of a challenge to you as the wine is sold out at the winery. It is still available in the retail market in both Washington and in the Portland area. (I found the bottle pictured at McCarthy & Scheiring in Queen Anne, you can also find it at Bin 41 in West Seattle, among others). Go find this wine, we may not ever get to experience summer here in the Northwest this year, but you should not be cheated out of a wine that was designed for warm weather and will certainly not be around long.